AASA has a long history of addressing asthma in schools. The goal of AASA’s work on asthma was always to build the capacity of school district leaders to develop best practices related to asthma in schools, ultimately to keep children with asthma in school and learning. In 2001, we were first funded by the Centers for Disease Control and Prevention (CDC) on an asthma management initiative we called The Asthma Wellness Project. Sixteen school districts worked with us to develop Powerful Practices: A Checklist for School Districts Addressing the Needs of Students with Asthma. This document, completed in 2006 and still relevant 10 years later, helps districts see both their strengths and areas for growth related to helping schools best serve the needs of children with asthma. We encourage you to download it and start assessing your district today. When The Asthma Wellness Project ended, AASA’s Children’s Programs department was funded for a second, five-year cycle by CDC. With the Leadership Forum for Healthy Students and Healthy Schools, we worked in collaboration with the National School Boards Association to lead five state teams to address asthma at the state level – in government and in schools. The report of that work is called Better Together: Collaborating to Improve Student Success and Well-Being. If your district hasn’t addressed asthma management practices in a while, start now. Use the Powerful Practices and reach out to community organizations, like your local American Lung Association, for assistance. 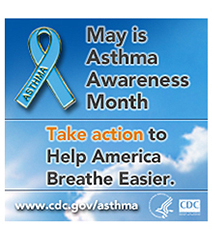 It is Asthma Awareness Month, after all!